HOUSTON -- A Space Exploration Technologies (SpaceX) Dragon spacecraft splashed down in the Pacific Ocean at 2:22 p.m. CDT Sunday a few hundred miles west of Baja California, Mexico. The splashdown successfully ended the first contracted cargo delivery flight contracted by NASA to resupply the International Space Station. "With a big splash in the Pacific Ocean today, we are reminded American ingenuity is alive and well and keeping our great nation at the cutting edge of innovation and technology development," NASA Administrator Charles Bolden said. "Just a little over one year after we retired the Space Shuttle, we have completed the first cargo resupply mission to the International Space Station. Not with a government owned and operated system, but rather with one built by a private firm -- an American company that is creating jobs and helping keep the U.S. the world leader in space as we transition to the next exciting chapter in exploration. Congratulations to SpaceX and the NASA team that supported them and made this historic mission possible." The Dragon capsule will be taken by boat to a port near Los Angeles, where it will be prepared for a return journey to SpaceX's test facility in McGregor, Texas, for processing. Some cargo will be removed at the port in California and returned to NASA within 48 hours. This includes a GLACIER freezer packed with research samples collected in the orbiting laboratory's unique microgravity environment. These samples will help advance multiple scientific disciplines on Earth and provide critical data on the effects of long-duration spaceflight on the human body. 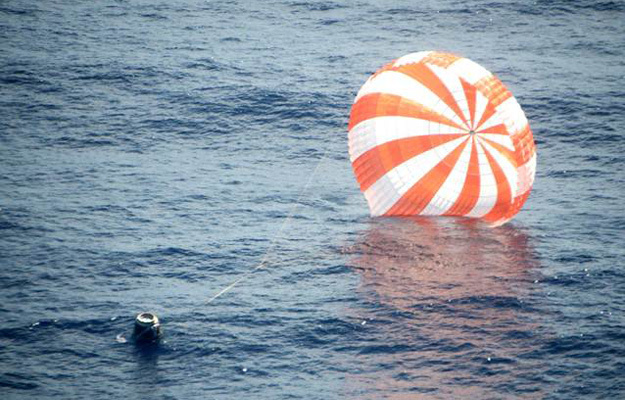 The remainder of the cargo will be returned to Texas with the capsule. The ability to return frozen samples is a first for this flight and will be tremendously beneficial to the station's research community. Not since the space shuttle have NASA and its international partners been able to return considerable amounts of research and samples for analysis. The mission was the first of at least 12 cargo resupply missions to the space station planned by SpaceX through 2016 under NASA's Commercial Resupply Services contract. SpaceX is one of two companies that built and tested new cargo spacecraft under NASA's Commercial Orbital Transportation Services (COTS) program. Orbital Sciences is the other company participating in COTS. A demonstration flight of Orbital's Antares rocket and Cygnus spacecraft to the station is planned in early 2013. NASA initiatives like COTS and the agency's Commercial Crew Program are helping develop a robust U.S. commercial space transportation industry with the goal of achieving safe, reliable and cost-effective transportation to and from the space station and low-Earth orbit. In addition to cargo flights, NASA's commercial space partners are making progress toward a launch of astronauts from U.S. soil in the next 5 years.